The outline of cartoon edition "Urusei Yatsura"
The author "Rumiko Takahashi" blood type A: Japan: It was born on October 10, 1957. Cartoon magazine "shonen sande": It's serialized from number 39 in 1978 to number 8 in 1987. 34 comic books: Story of 366. "LUM" of the draft stage. By putting a Twitter account and self-introduction in this book. when you'd like to do an exchange between the fans, please inform me. "theme" is announced to (Japan time) on Saturday every week. Please draw a picture by the shape which fits the contents. If you draw a picture, please send to "@urusei_1draw". · Tweet subjects every Saturday at 19 o'clock in Japan time. · Please draw at a convenient time. However, the drawing time should be approximately 1 hour. · Turn on the "#うる星ワンドロ" tag and tweet to "@urusei_1draw". · Close the day with tweets until 19:00 the next day. · Please refrain from painting that may be hurt by excessive Boys Love and grotesque etc. · Please refrain from posting past pictures. 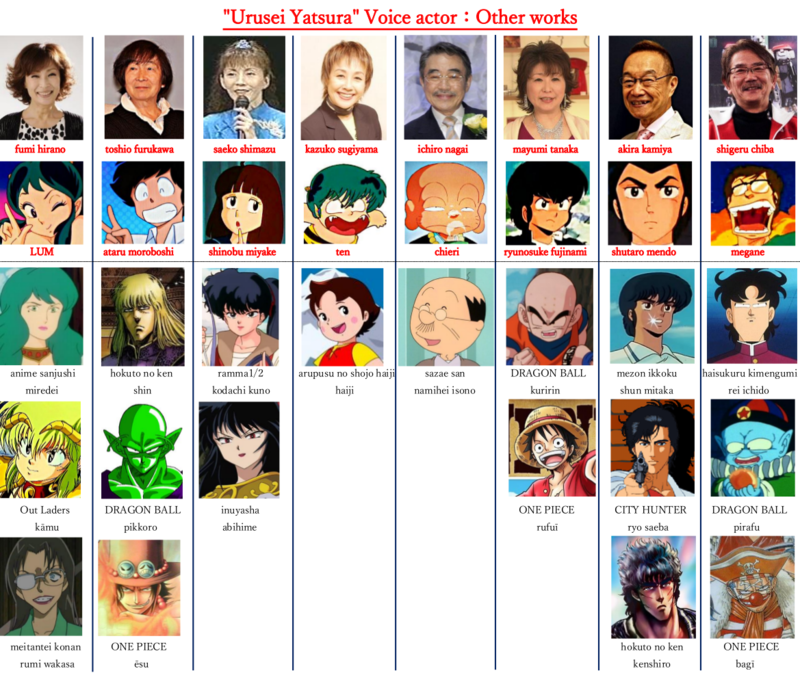 · If the Urusei Yatsura character is in, you can also co-perform characters of other RUMIC . ※ Other, opinions Opinion is in reply. source of a subtitle of "Urusei Yatsura". ※Reprinted by courtesy of "Urusei Yatsura no hakubutsushi"
"Urusei Yatsura taitoru no moto". 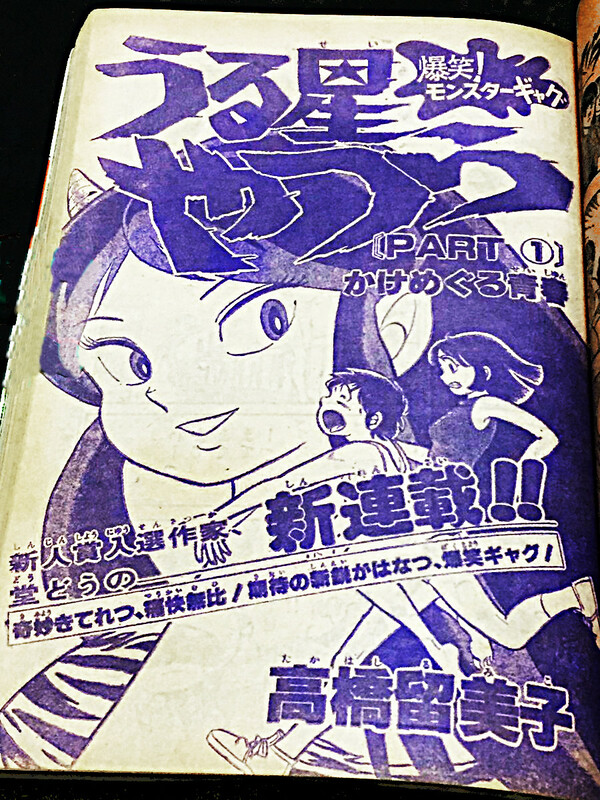 The cartoon early stage stage stage and the last chapter: The song name by which a subtitle of "Urusei Yatsura" is a popular song. Subtitle "kakemeguru seishun": Singer's name "byuteipea"
Subtitle "yasashii akuma": Singer's name "kyandeizu"
Subtitle "kanashiki amaoto": Singer's name "za・pinattsu "
Subtitle "anatani ageru": Singer's name "mineko nishikawa"
Subtitle "zettai zetsumei": Singer's name "momoe yamaguchi"
Subtitle "oyuki": Singer's name "kunio naito"
Subtitle "aide koroshitai": Singer's name "sakasu"
Subtitle "saketo namidato otokoto onna": Singer's name "eigo kawashima"
Subtitle "nikumikirenai rokudenashi": Singer's name "kenji sawada"
Subtitle "iihi tabidachi": Singer's name "momoe yamaguchi"
Subtitle "oshobu": Singer's name "kiyoko suizenji"
Subtitle "saga": Singer's name "masanori sera & tsuisuto"
Subtitle "keizu": Singer's name "wataru takada"
Subtitle "ayatsuri ningyo": Singer's name "hiroko taniyama"
Subtitle "imada fujosezu": Singer's name "peni・rein"
Subtitle "shiawaseno kiiroi ribon": Singer's name "recorded by Tony Orlando & Dawn"
Subtitle "deisuko・infueruno": Singer's name "The Tramps"
Subtitle "sayonarao iu kimonai": Singer's name "kenji sawada"
Subtitle "onnani natte denaoseyo": Singer's name "goro noguchi"
Subtitle "omoi sugoshimo koinochi": Singer's name "sazan oru sutazu"
Subtitle "yukiga areba": Singer's name "hideki saijo"
※Real serialization has started with a comic book. The title "toraburuha maiorita!!". "Rumiko Takahashi" don't rest to The last episode kept drawing. The main title "Boy Meets Girl": The title of 1983 year French movie. Subtitle "makkuroke": Singer's name "bakufu surampu"
Subtitle "yomeni konaika": Singer's name "kenji niinuma"
Subtitle "wakareno asa": Singer's name "pedoro & kapurishasu"
Subtitle "hatono Ignition": Singer's name "satomi fukunaga"
Subtitle "saikaino rabirinsu": Singer's name "sonoko kawai"
Subtitle "kekkon surutte hontodesuka": Singer's name "dakapo"
Subtitle "nejiretahatode": Singer's name "kaori momoi & takao kisugi"
Subtitle "komatchauna": Singer's name "rinda yamamoto"
Subtitle "donimotomaranai": Singer's name "rinda yamamoto"
Subtitle "naimononedarino IWantYo": Singer's name "CCB"
Subtitle "Fin": Singer's name "akina nakamori"
The debut story "Kattena Yatsura" outline of the author who became source of "Urusei Yatsura"
1978: "shogakkan" new face comics grand prize part 2. "fine work" winning prize. ★Play: "Urusei Yatsura" check ! Kiss "LUM". Kiss "LUM":when you exceed a total point. The attitude of "LUM" changes by your Lv. organizer"夏侯勇 ‏@kakouyuu":participant"Mr.T ‏@showtook" "おゆ ‏@ranyuriko15"
dates:January 1,2017 inventor"LUM @lumtolovelove" organizer"夏侯勇 ‏@kakouyuu"
★Special Events：animator"makoto kanai", & "Small_LUM"
left："makoto kanai @kanaman7" right："isamu kakoyu @kako_yuu"
★Story of "Urusei Yatsura": frontispiece in "sande" publication. 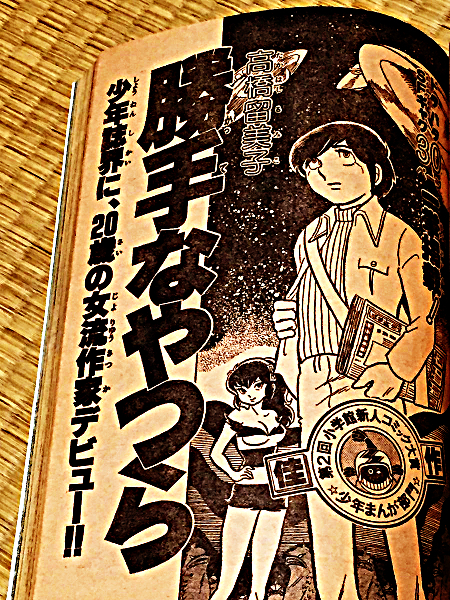 Story of "Urusei Yatsura": frontispiece in "sande" publication. 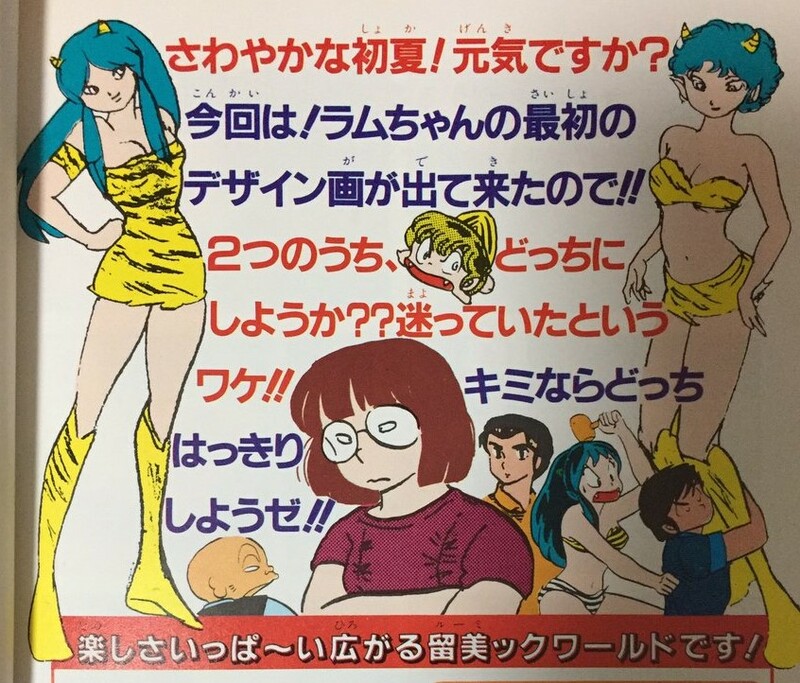 ★"Urusei Yatsura" the fan club bulletin magazine collection. It's being renewed: In whole, 22 stories. "Urusei Yatsura" the fan club bulletin magazine collection. 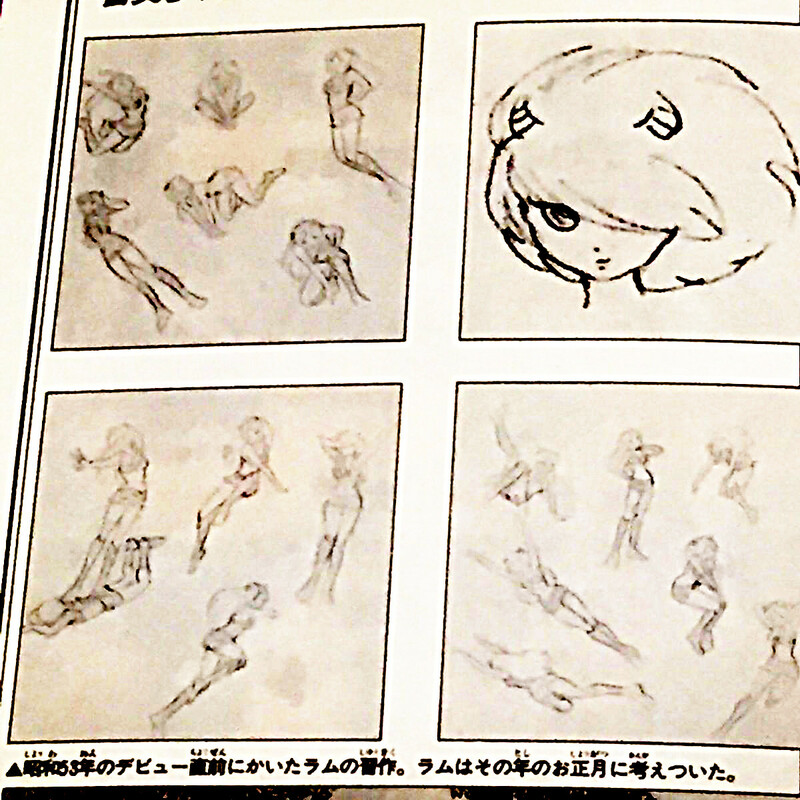 ★.drawing, support: "one's own making. LUM"
※：prohibited："unauthorised copying" and "commercial use".